Considering the equal importance of GABAergic and glutamatergic synapses, and the arguably greater potential of GABA synapses as therapeutic targets given the variety of GABAA receptors, surprisingly little is known about how GABAergic synapses are assembled. It seems that the GABAergic synaptic components are not as amenable to assay by yeast two-hybrid methods, and there has yet to be developed a selective inhibitory postsynaptic density biochemical fractionation method. Thus the next major step in the field will be to identify more of the constituent molecules of GABAergic postsynaptic elements. Of the components that have been studied, the cadherin-catenin and neuroligin-neurexin pairs may function early to mediate adhesion between the pre- and post-synaptic partners and to recruit synaptic components. The GABAA receptor Y2 subunit is important for targeting a and P subunits as well as gephyrin to the developing or mature synapse, by interactions of TM4 and the large intracellular loop with as yet unidentified partners. 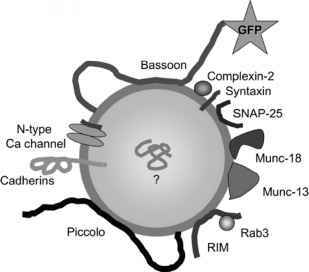 The scaffolding protein gephyrin contributes in part to recruiting some GABAA receptor subunits and to recruiting other components, including glycine receptors. Finally, the DGC acts late in development, perhaps in stabilization of the mature GABAergic synapse. The recent discovery of neuroligin-2 as a component of GABAergic but not glutamatergic postsynaptic sites, and the ability of neurexins to trigger GABAergic postsynaptic differentiation via neuroligin-2, is likely to lead to rapid further progress. Such progress will necessarily involve identifying the missing links between neuroligin, cadherin, gephyrin, the DGC, and GABAA receptors. In vivo mutagenesis of neuroligins may prove fertile, as have the in vivo point mutants altering benzodiazepine sensitivity in individual GABAA receptor subunits. Eventually, we look forward to molecular analyses to understand the basis of the complex differential cellular domain targeting of GABAergic input types and differential postsynaptic trafficking of GABAA receptor subunit combinations.